Sorrell and Son 1927 with H.B. Warner and Alice Joyce. Partially shot on location in England and produced independently by veteran filmmaker Herbert Brenon at United Artists, the 1927 Sorrell and Son is a skillful melodrama about paternal devotion in the face of both personal and social adversity. This long-thought-lost version of Warwick Deeping's 1925 bestseller benefits greatly from Brenon's assured direction, deservedly shortlisted in the first year of the Academy Awards. Crucial to the film's – surprising – effectiveness, however, is the portrayal of its central character, a war-scarred Englishman who sacrifices it all for the happiness of his young son. Luckily, London-born stage and screen veteran H.B. Warner, best remembered for playing Jesus Christ in another 1927 release, Cecil B. DeMille's The King of Kings, rises to the occasion, skirting over-earnestness and self-pity while coming across as the embodiment of honesty, selflessness, and devotion. Unlike many silent era performers – even in the relatively more subtle late 1920s – Warner's never begs for the audience's sympathy. In Sorrell and Son, you don't see him with eyes plaintively turned upwards to heaven or downwards to some pitless hell. Instead, he seizes the viewer's compassion by painstakingly bringing his character to three-dimensional life: his war veteran is not just a long-suffering Dad; he's also resolute, confused, proud, debased, strong, weak. The viewer can appreciate the emotional mélange without the need for 3D glasses; it's all clearly conveyed by Warner's facial expressions and body language. It's evident that, unlike most performers and filmmakers then and now, either H.B. Warner or Herbert Brenon – or both – believed that for a sentimental melodrama to be taken seriously, less is always more. Set in England in the aftermath of World War I, Sorrell and Son tells the story of Stephen Sorrell (H.B. Warner), a returning war veteran who suffers all sorts of humiliations and privations just so he can support his young son, Kit (Mickey McBan), following the desertion of his self-centered wife, Dora (Anna Q. Nilsson). Despite its sappy premise, Sorrell and Son is no Stella Dallas or Madame X in male drag. Besides its depiction of the difficult social environment in post-war England, the film – adapted by Brenon's frequent collaborator Elizabeth Meehan (The Great Gatsby, Laugh Clown Laugh) – also delves into a series of complex issues, some of which remain highly controversial to this day. Among the goodies thrown into the interpersonal mix are lust, envy, jealousy, class distinctions, incestuous desires, and, capping it all off, euthanasia. 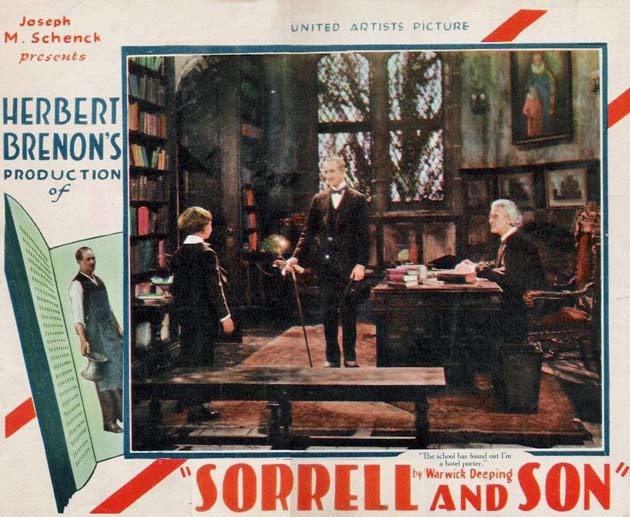 'Sorrell and Son' 1927 lobby card. The Sorrell and Son supporting cast is generally capable, with Anna Q. Nilsson – by then a veteran of more than 150 shorts and features – nearly stealing the show as the jazzy mother who abandons husband and son to enjoy her own glamorous life. Once the son (grown into Nils Asther) becomes a respected young doctor, Mom returns. That's when her maternal feelings flourish, as she comes to the realization that she really – but really – cares for her handsome offspring. Additionally, there's another film veteran, Alice Joyce, as Warner's warm-hearted, late-life love interest. 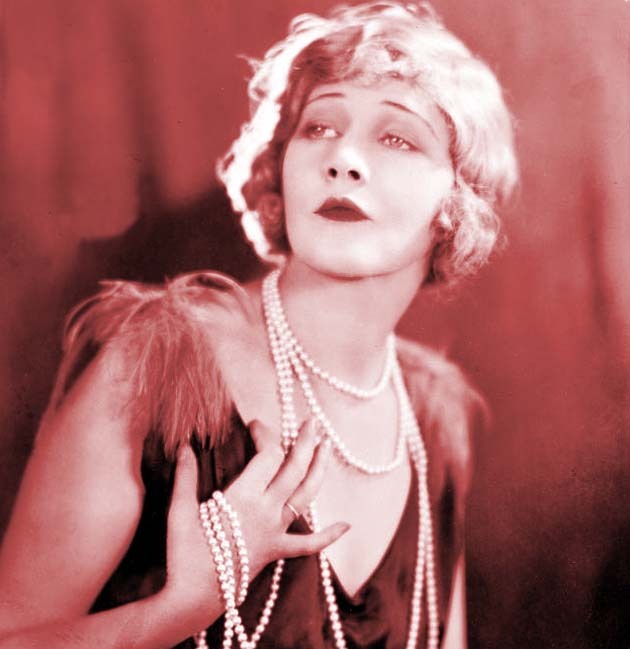 One of the most restrained performers of the 1920s, Joyce underplays to perfection. As mentioned in the first paragraph of this brief commentary, Sorrell and Son was thought lost until a few years ago. Part of the last reel remains missing (photographs were used to complete the narrative), and much of the picture is so contrasty that at times the actors' facial features get all but washed out. Yet even though the condition of the currently available print makes it impossible to appreciate the work of masterful cinematographer James Wong Howe, the fact that nearly a century later one can still appreciate both the film's drama and its performances is an indication of what a remarkable accomplishment Sorrell and Son is. Irrespective of its age and overall physical health, this is one movie that, if you're given the rare chance to check it out, should not be missed. Scr. : Elizabeth Meehan. From Warwick Deeping's novel. Cast: H.B. Warner. Nils Asther. Anna Q. Nilsson. Alice Joyce. Carmel Myers. Mary Nolan. Mickey McBan. Louis Wolheim. Norman Trevor. Lionel Belmore. Paul McAllister. Betsy Ann Hisle. 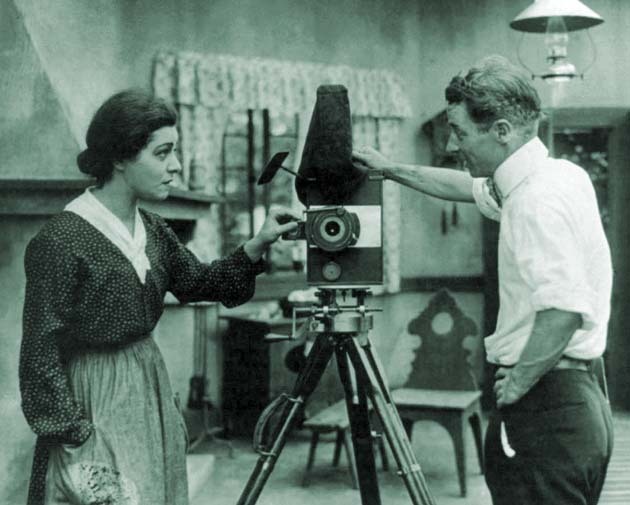 Herbert Brenon and Alla Nazimova possibly during the making of 'War Brides' (1916). Early in the 1910s, the Dublin-born, London-educated Herbert Brenon became one of the most important filmmakers of the silent era after directing top leading man King Baggot in a production of Ivanhoe filmed on location in Wales. At various studios – and at times independently – Brenon would go on to handle a whole array of major and up-and-coming stars, among them Annette Kellerman (Neptune's Daughter, the costly Daughter of the Gods), Theda Bara (in a series of star vehicles at Fox), Valeska Suratt, Nita Naldi, Bessie Love, Tom Moore, Norma Talmadge (The Wonderful Thing), Alla Nazimova (War Brides), and Pola Negri and Antonio Moreno (The Spanish Dancer, restored a few years ago). Besides, Brenon also directed top names of the London stage – e.g., Marie Lohr, Ellen Terry, Matheson Lang – in the never-completed World War I propaganda film The Invasion of Britain a.k.a. Victory or Peace (1918), a sort of Red Dawn in which the invaders are German and the invadees are British. In A Special Relationship: Britain Comes to Hollywood and Hollywood Comes to Britain, film historian Anthony Slide describes The Invasion of Britain as “certainly the most expensive film that never was” up to that time. Following the coming of sound, the Hollywood career of the by then 50-year-old Herbert Brenon – known as a difficult man with an anti-Semitic bent (“I have a pretty bad reputation for Intolerance,” he once said) – went fast downhill. In the second half of the 1930s, he made about a dozen movies in England (e.g., the all-star Royal Cavalcade, the well-received Housemaster) the last of which, The Flying Squad (1940), turned out to be his final film. Sorrell and Son remained Brenon's favorite among his movies. He died at age 78 in June 1958 in Los Angeles. * Curiously, Gloria Swanson never worked with Herbert Brenon, even though both were busy at Famous Players-Lasky / Paramount in the 1920s. At a time when women were responsible for a sizable chunk of the domestic box office, father-love stories were much less common than mother-love ones. In that regard, Sorrell and Son is an exception to the rule, as moviegoers were usually fed tales about Moms sacrificing it all for love of her child(ren). Pauline Frederick and Gladys George in Madame X (1920, 1937). Norma Talmadge in The Lady (1925) and Irene Dunne in the 1933 remake The Secret of Madame Blanche. Ruth Chatterton in Madame X (1929), Sarah and Son (1930), and Frisco Jenny (1933). Dorothy Peterson in Mothers Cry (1930). Constance Bennett in Common Clay (1930). Best Actress Academy Award winner Helen Hayes in The Sin of Madelon Claudet (1931). Tallulah Bankhead in Tarnished Lady (1931). Jean Arthur in Most Precious Thing in Life (1934). Kay Francis in My Bill (1938). Bette Davis in The Old Maid (1939). The best-remembered father-love hit of the 1930s is probably King Vidor's The Champ (1931), starring Wallace Beery as a down-and-out boxer and Jackie Cooper as his adoring son. Directed by Franco Zeffirelli, a 1979 remake starred Jon Voight and Ricky Schroder. Never a top star, the Swedish-born Anna Q. Nilsson was a popular leading lady from the mid-1910s to the dawn of the sound era. Among her best-known films – for those familiar with silent movies – are Raoul Walsh's Regeneration (1915), Cecil B. DeMille's Adam's Rib (1923),** and Alfred E. Green's Inez from Hollywood (1924), besides two efforts directed by Herbert Brenon: The Rustle of Silk (1923) and The Side Show of Life (1924). During the talkie era, Nilsson is best remembered for her cameo in the “waxworks” sequence in Billy Wilder's Sunset Blvd. (1950), playing bridge with Gloria Swanson, Buster Keaton, and her Sorrell and Son co-star H.B. Warner. A Best Supporting Actor Oscar nominee for Frank Capra's Lost Horizon (1937), Warner died at age 83 in Dec. 1958, a few months after Herbert Brenon's death. Nilsson died at age 85 in Feb. 1974. ** DeMille's Adam's Rib is unrelated to the 1949 Katharine Hepburn-Spencer Tracy battle of the sexes comedy. Alice Joyce was possibly a unique case in early Hollywood history: a star at the beginning of the 1910s (The Christian, The American Princess), Joyce's career went through a lull in the early '20s right before she made a surprisingly successful comeback at age 35 in mid-decade (The Home Maker, Brenon's Dancing Mothers, The Little French Girl, and Beau Geste). Alice Joyce kept on working until 1930. Three years later, she married MGM director Clarence Brown (Anna Christie, National Velvet); the couple were divorced in 1945. A decade later, she died of a heart ailment at age 65. James Wong Howe ca. 1950s. James Wong Howe's career went from the 1923 Mary Miles Minter star vehicles Drums of Fate and The Trail of the Lonesome Pine all the way to the Barbra Streisand star vehicle Funny Lady (1975) – more than half a century and nearly 140 features later. Daniel Mann's The Rose Tattoo (1955), starring Anna Magnani, Burt Lancaster, and Marisa Pavan. Martin Ritt's Hud (1963), starring Paul Newman, Melvyn Douglas, Patricia Neal, and Brandon De Wilde. James Wong Howe's first nomination was for John Cromwell's Algiers (1938), Walter Wanger's independent production starring Charles Boyer and Hedy Lamarr. Nearly four decades later, Howe's last nod was for Herbert Ross' Funny Lady, starring Streisand and James Caan. The Chinese-born Howe died at age 76 in July 1976 in Los Angeles. A 1933 British-made talkie version of Sorrell and Son starred H.B. Warner once again as Captain Stephen Sorrell. Others in the cast were Margot Grahame as Dora Sorrell, Hugh Williams as the adult Kit Sorrell, and Peter Penrose as the young Kit. Jack Raymond, never quite a major name in the British film industry, directed from an adaptation by Lydia Hayward. Directed by Derek Bennett, a 1984 British TV miniseries starred Richard Pasco as Sorrell, Peter Chelsom as the adult Kit, Paul Critchley as the young Kit, and Gwen Watford as Dora. Herbert Brenon's Sorrell and Son was nominated for one Academy Award in the 1927-28 period. Winner: Frank Borzage for 7th Heaven. † In the first year of the Academy Awards, covering films released in the Los Angeles area between Aug. 1927 and July 1928, the Best Director award was split in two categories: Dramatic Picture and Comedy. Herbert Brenon quote via Anthony Slide's A Special Relationship. Sorrell and Son movie cast info via the IMDb. Lobby card and image of Alice Joyce and H.B. Warner in Sorrell and Son: Courtesy of Derek Boothroyd, via Greta de Groat's Alice Joyce website. Herbert Brenon and Alla Nazimova image via Wikipedia. 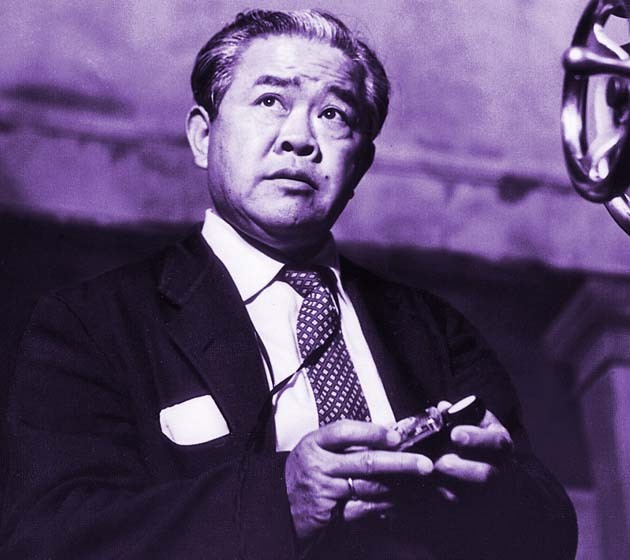 James Wong Howe photo via cinearchive.org.